The effect of Industrialisation shown by rising income levels since 1500. 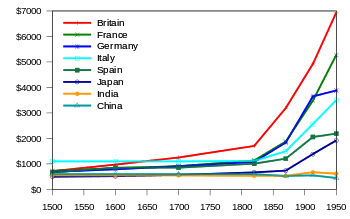 The graph shows the gross domestic product (at []) per capita between 1500 and 1950 in 1990 International dollars for selected nations. The first transformation to an industrial economy from an agricultural one, known as the Industrial Revolution, took place from the mid-18th to early 19th century in certain areas in Europe and North America; starting in the Netherlands and Great Britain, followed by Belgium, Germany, and France. Characteristics of this early industrialization were technological progress, a shift from rural work to industrial labor, financial investments in new industrial structure, and early developments in class consciousness and theories related to this. Later commentators have called this the First Industrial Revolution. By the end of the 20th century, East Asia had become one of the most recently industrialised regions of the world. The BRICS states (Brazil, Russia, India, China and South Africa) are undergoing the process of industrialization. 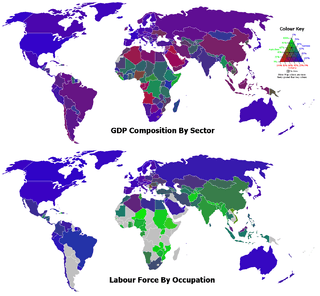 GDP composition of sector and labour force by occupation. The green, red, and blue components of the colours of the countries represent the percentages for the agriculture, industry, and services sectors, respectively. Currently the "international development community" (World Bank, Organisation for Economic Co-Operation and Development (OECD), many United Nations departments, and some other organisations) endorses development policies like water purification or primary education and Co-Operation amongst third world communities. Some members of the Economic communities do not consider contemporary industrialisation policies as being adequate to the global south (Third World countries) or beneficial in the longer term, with the perception that it could only create inefficient local industries unable to compete in the free-trade dominated political order which it has created. The relationships among economic growth, employment, and poverty reduction are complex. Higher productivity is argued to be leading to lower employment (see jobless recovery). There are differences across sectors, whereby manufacturing is less able than the tertiary sector to accommodate both increased productivity and employment opportunities; more than 40% of the world's employees are "working poor", whose incomes fail to keep themselves and their families above the $2-a-day poverty line. There is also a phenomenon of deindustrialisation, as in the former USSR countries' transition to market economies, and the agriculture sector is often the key sector in absorbing the resultant unemployment. ↑ Depicting data excerpted from Contours of the World Economy, 1–2030 AD. Essays in Macro-Economic History by Angus Maddison, Oxford University Press, 2007, ISBN 978-0-19-922721-1, p. 382, Table A.7. ↑ O'Sullivan, Arthur; Sheffrin, Steven M. (2003). Economics: Principles in Action. Upper Saddle River, New Jersey 07458: Pearson Prentice Hall. p. 472. ISBN 0-13-063085-3. OCLC 50237774. ↑ "Sustainable Industrialization in Africa - Springer" (PDF). download.springer.com. Retrieved 2016-09-23. ↑ Industry & Enterprise: An International Survey Of Modernisation & Development, ISM/Google Books, revised 2nd edition, 2003. ISBN 978-0-906321-27-0. ↑ Lewis F. Abbott, Theories Of Industrial Modernisation & Enterprise Development: A Review, ISM/Google Books, revised 2nd edition, 2003. ISBN 978-0-906321-26-3. ↑ United Nations Millennium Development Goals. Un.org (2008-05-20). Retrieved on 2013-07-29.